Between daycare, holiday parties and brutal winter temps, it seems like someone in the house is always catching a cold. And before you know it, the entire family is hunkered in on the couch with a box of tissues. Say Yes to Vitamin C: Vitamin C is a natural antioxidant (which can boost the immune system and protect the body from free radicals), so it makes sense to load up this time of year. In fact, Vitamin C needs to be eaten regularly and in adequate doses to do its job, so it’s essential to incorporate it into your diet year round, NOT just when symptoms appear! However, there’s no need to spring for a fancy supplement! Find it naturally in citrus fruits, strawberries, tomatoes and bell peppers. Try this hearty Stuffed Sweet Peppers recipe the whole family will love! Pack on Probiotic-Rich Foods: Fermented foods like unsweetened yogurt, kimchi and sauerkraut are naturally rich in probiotics, which can improve gut health and get that digestion flowing! This can help flush your system, and good news: research has shown fermented foods may protect the immune system from the flu virus. It’s also been shown to reduce common cold symptoms–bonus! Reach for Elderberry Syrup: Elderberry syrup is an age-old remedy that has been shown to help protect against cold and flu, as well as reduce symptoms in those who are already sick. Snag a bottle of elderberry syrup at your local health store, or save some money by making your own! Wind Down: Stress can take a major toll on the immune system, so it’s important to incorporate calming exercises like kid-friendly yoga, meditation or coloring. And be sure your family is getting a good night’s sleep, which can help strengthen the immune system (without even having to lift a finger). Win, win. Optimize Your Vitamin D: During the winter months, folks tend to get much less sunlight, especially those of us here in the Northeast. This can lead to a deficiency in Vitamin D, the “Sunshine Vitamin.” Get your levels tested by your doctor, as Vitamin D is vital for the immune system to fight off bacteria and viruses. If your levels are lower than normal, speak with your medical professional about the best form of supplementation for your family. Go for Garlic: While it may leave behind a strong odor, garlic is a potent, nutrient powerhouse. With antibacterial, antiviral and antimicrobial properties, fresh, raw garlic a must for winter wellness! 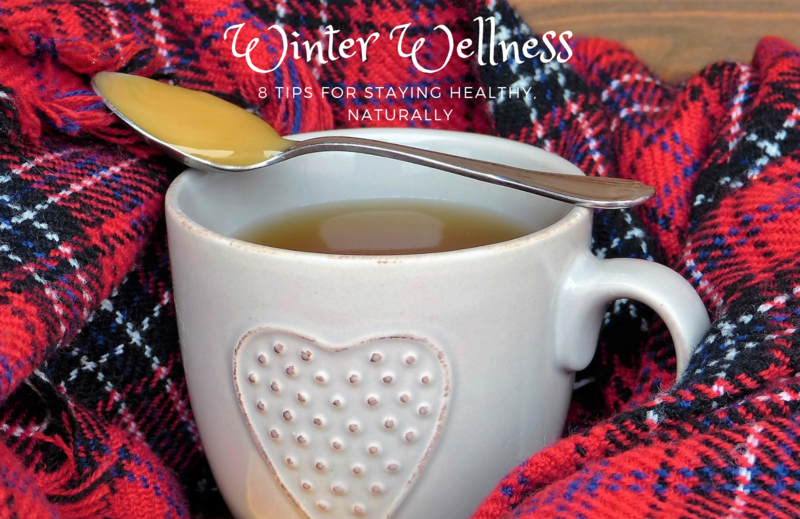 Mix it into your soups and sauces, or moms and dads may want to try a shot of Fire Cider, an apple cider vinegar tonic packed with health-boosting ingredients like ginger, turmeric, citrus fruit and you guessed it: garlic. Break the Sugar Habit: While cookies and juice boxes may be your kids’ favorites, it’s best to avoid refined, added sugars as much as possible, especially at any signs of illness. Sugars can cause inflammation and suppress the immune system, which makes you more susceptible to catching a cold. Reach for naturally sweet seasonal produce like pomegranate, sweet potatoes and carrots instead. Keep it Clean: Wash your hands frequently, and encourage your kiddos to do the same! Pack a natural hand sanitizer – like this one from Dr. Bronner – in your purse, diaper bag or little one’s backpacks for on-the-go clean up. Also keep your rooms well ventilated, and you may even want to consider purchasing an indoor air purifier to remove viruses and bacteria that may be lingering from coughs and sneezes. Looking for more simple tips to keep your family healthy? Learn more in 52 Small Changes for the Family, available now for preorder.